The Poodle is one of the most popular dogs in the US and many other countries. They gained their popularity by being one of the most intelligent dog breeds plus they make a great family pet. Furthermore, the fact that they come in many different sizes and colors also helped to make them very popular by pleasing all types of dog lovers. 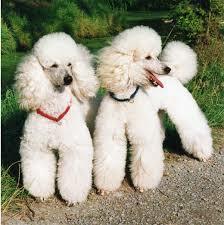 Poodles are high maintenance dogs and need to be groomed regularly. Being there are many different hairstyles that you can give your Poodles I will be writing a series of articles about Poodle grooming. This is the first in the series and we will begin with basic Poodle grooming tips, this will help you get an idea of all that is involved in grooming your poodle no matter what size he/she is. Make sure to subscribe to this site so you will receive updates and be notified each time I add a new article. Thare is a big debate on what to call the coat of a Poodle. Is it hair, fur or wool? Well, let us break it down. Fur grows to a pacific length then stops growing. Wool is very thick with an undercoat that is commonly used for making clothes. Then there is hair, hair comes in many forms from thick to thin, straight or curly and it continues to grow. Knowing this I will have to go with Poodles have hair being they do not have an undercoat and their hair continues to grow. Furthermore, Poodles do shed just like humans, we all lose hairs and get new hair growth in its place. Being Poodle hair is curly the loose hairs get tangled around the curls instead of falling off the dog. If not brushed regularly those loose hairs will turn into mats. The mats will continue to get bigger as more hair sheds. 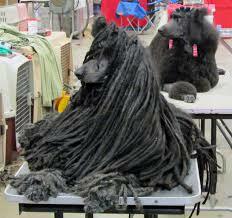 Unless you want your Poodle to have a Corded coat you will need to brush his/her hair regularly. 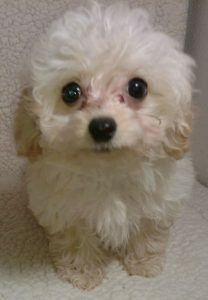 Poodle puppies have soft wavy coats until the age of 8-9 months, this will vary with each dog. 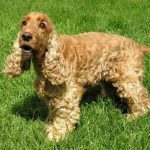 As your puppy gets older you will begin to notice the waves turning into curls and the texture of the hair becoming thick and course. It takes approximately 9 months to complete the transformation from a puppy coat to an adult coat for Teacup, Toy and Miniature Poodles and around 3 months for the Standard Poodle. According to the American Kennel Club Poodles should have curly dense hair throughout the entire body. The corded coat is acceptable by the AKC. It also can be of show quality if the cords are correctly sized. Not all Poodle are created equally! 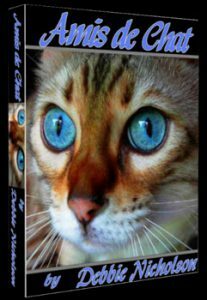 Being the breed is so popular overbreeding naturally occurred. This resulted in different textures and colors of Poddle hair. Whether your Poodle has thick curly hair or soft wavy hair the grooming procedure is basically the same for all Poodles. Poodles need to begin getting groomed when they are just a few weeks old. 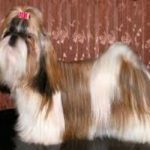 Start with weekly brushings, bathing at least once a month and hair trimming every 4-6 weeks. By owning a Poodle you must make the time for basic grooming. Turn it into a routine whether you plan on grooming in between visits to a professional groomer or if you plan to groom your dog full time. Always be patient and never yell, you want your dog to honor you not fear you. Getting your Poodle accustomed to the grooming process takes time and patience. You will also be building a bond between you and your dog that will last a lifetime. When your Poodle puppy hair starts to change into an adult coat he/she will require more frequent brushings. 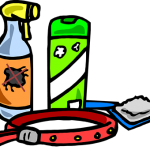 By this time your pup should be accustom to all grooming procedures. If you are brushing your dog every day to every other day I recommend using a Pin brush. 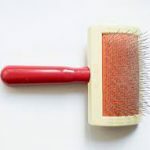 The Pin brush will remove the loose hair without damaging the coat. If you are not brushing your dog that often than I recommend using a Slicker brush. 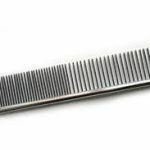 The Slicker brush is much better at removing tangles and small mats but tends to break hairs causing damage to the coat. To learn more about what brush to use please visit my article about the best Grooming Brushes. Before you start brushing mist some conditioner spray on the area of hair you are about to brush and continue to mist as you move on to other areas. Begin brushing from the ends of the hair working your way down to the base. Brushing in sections will help make sure you are doing a complete brush out. Then down around to the chest. Hold your Poodles nose up to reach around the neck and chest. Brush the head and both sides of the ears making sure to get behind the ears, this section tends to mat easily. The skin on the inner ear is sensitive, pay close attention to not brush too hard. Have your dog sit while brushing the front legs. Gently holding his/her paw brush up the legs to the shoulder. Make sure you are brushing all the way around the leg. Pay special attention to the underarms as they also tend to mat easily. Have your dog stand on all 4 paws as you brush each side and the back legs. 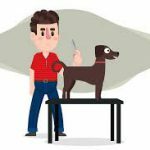 To finish the brushing procedure hold your dogs front paws making him stand on his back legs for small Poodles, you will be able to reach this section easily on a Standard. Brush from the belly button up to the chest. Never brush the belly or face with a Slicker brush because it will scratch the delicate skin of those areas. 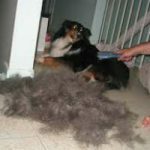 You will be shaving the face and belly with a # 10 blade so no need to worry about brushing (unless you are giving your dog a Teddy Bear Cut, more on this later). Never bath a matted Poodle, the shampoo and water only make it worse and harder to remove the mats and tangles. 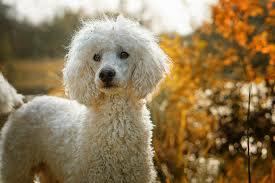 Make sure you have removed all tangles and mats by going back over your Poodles coat with a metal comb. The order in which you brush your dog is a personal preference and makes no difference as long as you make sure to reach every area. The above brushing procedure is my personal preference that I have been doing for years. It is very common for Poodles to have excess eye tearing, you should wipe the tears from your Poodles eyes 2-3 times a day. This process will help to prevent eye staining and prevent the beginning of a red yeast infection. There are several reasons as to why your Poodles eyes tear. Finding the cause can reduce and/or eliminate the problem. An important step to reducing tear staining is to use a high-quality Tear Stain Remover. If your dog is overgrown you will want to remove some hair before bathing. This will save you time when shampooing and drying. No need to worry about getting it even now, this is what we call a rough cut. You will be evening the hair after you Fluff Dry. Bathing a Poodle is basically the same as bathing any other breed except you will not be using a rinse off conditioner. Many conditioners will make the hair heavy and unable to stand up. This is something we do not want, a Poodles hair needs to fluff out like a cotton ball. I recommend using a spray conditioner made especially for Poodles. Please Click Here to learn more about bathing, ear cleaning, teeth cleaning and nail trimming procedures. After you bath your Poodle towel dry to remove as much water as possible. Now you will need to Fluff Dry your Poodles hair. If you need to learn how to Fluff Dry please visit my article on How to Fluff Dry a Dog’s Hair. Now you are ready to give your Poodle the finishing cut. I will go step by step in all the different ways to style your Poodle in the following series of Poodle Grooming Tips and More. I hope you found this information to be helpful and easy to follow. If you need help or have a question please feel free to leave me a comment and I will get back to you ASAP. I dont see how to subscribe to this page, which I find to be really helpful and informative. 25 years ago I was a groomer, but I did my best work on Schnauzers, not Poodles. Now we own a Spoo and I have areas I would like to improve on. How do I subscribe to your page? Thank you for visiting my site, I am glad you found it to be helpful. Look on the right-hand side of this page and you will see a subscribe box, just fill in your name and email then click subscribe. You will then be notified each time I add new information. This is very fortuitous, I have just acquired some pet grooming equipment including clippers and need some help to become a gentle and confident groomer to my two yorkie x bichons. One is very poodle like and both do not shed which is a real bonus. Seeing as poodles have a similar coat to the bichon, this post is ideal for me to learn the basics. Thank you very much for the information and I will definitely be keeping an eye on this website! I am happy that you found the information to be helpful. I will be adding more post on how to groom Poodles so please subscribe to the site and you will be notified with each new post. Thank you for stopping by, I look forward to you future visits.